Every kids love dinosaurs! They love to imitate a paleontologist - digging something on the sand and pretending they have found a piece of a dinosaurs bone etc...just like in Jurassic Park movies! 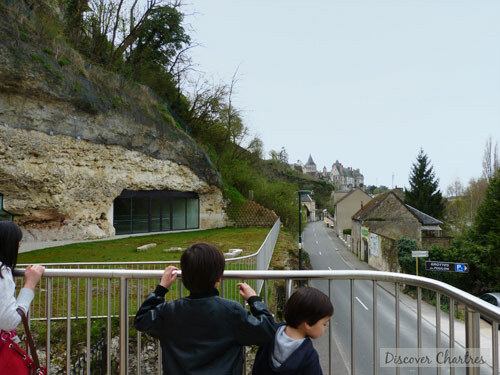 Last Easter holiday, me and my kids went to Chateaudun - only about 45 minutes travel from Chartres. We went there together with a group of family from Chartres Community Center. 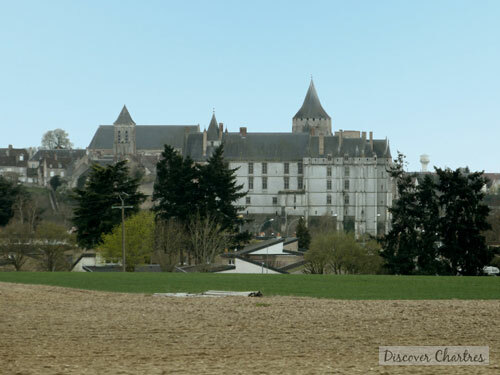 Does Chateaudun have something to do with the dinosaurs? 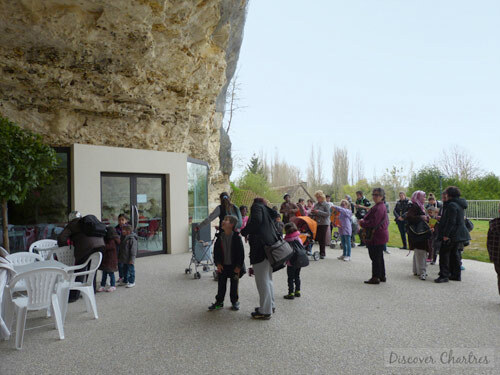 That day we did a paleontology travel to the caves of Foulon - Les Grottes du Foulon. 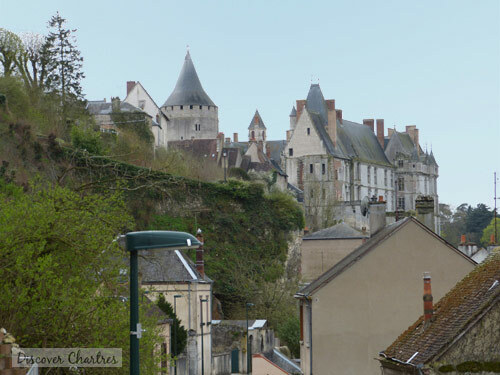 Now you know that Chateaudun has not only have a beautiful castle to see. 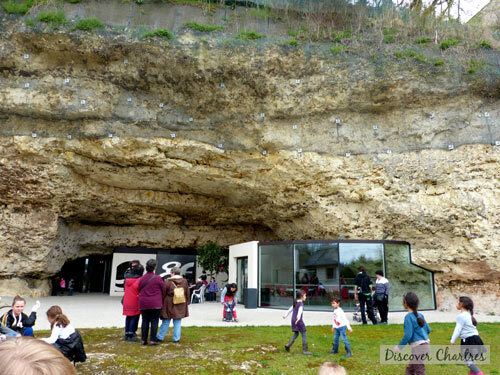 Les Grottes du Foulon is situated 40 km on the south of Chartres and 135 km from Paris. We went on a bus but you can also reach the place by train from Chartres. The train station is not too far away and within a walking distance... if you love walking of course! The guided visit takes place every hour so if you arrive on site 30 minutes after the first group has walked inside the cave, that means you have to wait another 30 minutes for your turn. Just as shown on the picture above, you can wait in the front yard. Or...having a cup or two of coffee from a vending coffee machine. Have a seat please! Or... admiring the château de Châteaudun, which is just nearby. Zoom out the castle... it's beautiful, isn't it? Finally our waiting has come! 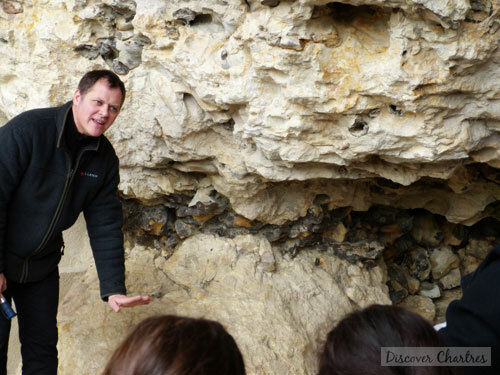 Jérôme Philippot, the actual owner of the caves (yep... the caves are private properties!) was our guide that day. The guided visit started just outside of the cave. We can see obviously the famous Cretaceous Tertiary boundary or KT layers which marked the extinction of the dinosaurs 65 millions years ago. Thousands of giant sea geodes with the aquatic animal prints can be found here. They contains quarts crystals and chalcedony which give them bright looks. The huge tsunami that also caused the mass extinction of the dinosaurs has probably brought the ocean life to land, that is why we can found both marine and terrestrial dinosaurs in the same place in Foulon. New discoveries: fossils of dinosaurs have been found in August 2010 and a giant vertebrate in June 2011. 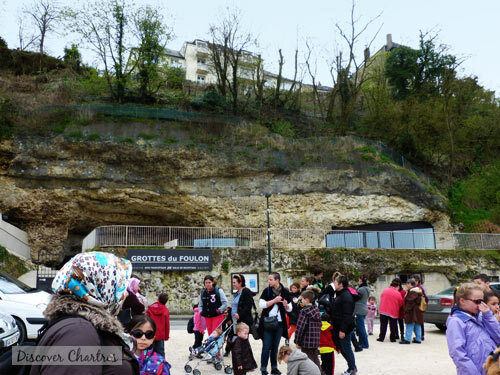 Les Grottes du Foulon is a natural limestone caves that was formed by rain waters 300 thousands years ago. The caves were inhabited by the humans of Paleolithic since the prehistoric time. 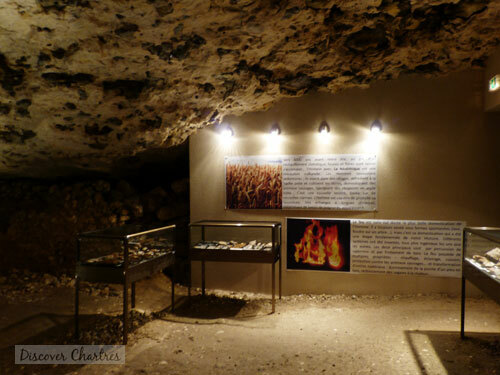 The caves also took part in France history during the revolution war - the Germans troops served them as shelter and equipment store. Unfortunately I cannot find a brief way to write them down but Les Grottes du Foulon indeed has quite random opening hours. You have to check them out before heading out! January 5 - April 12 : opens on Saturday, Sunday and public holiday from 2pm - 5pm. April 13 - June 30 : daily from 2pm - 5pm (closed on Monday and Wednesday), remains open on Mai 1, 8, 9 and 20. July and August : daily from 10am - 12pm and 2pm - 6pm, Saturday until 5pm, closed on Monday morning. September 2 - December 31 : Saturday and Sunday from 2pm - 5pm. Holiday of Toussaint : daily from 2pm - 5pm, closed on Monday and Wednesday. Closed on August 24 until September 1, December 14 until 30. Possible visit in group (min. 10 persons) for any days of the year - only on reservation. Come in group (min 10 person) and you will have a discount. The temperature inside the caves is about 12°C so prepare your warm coats. 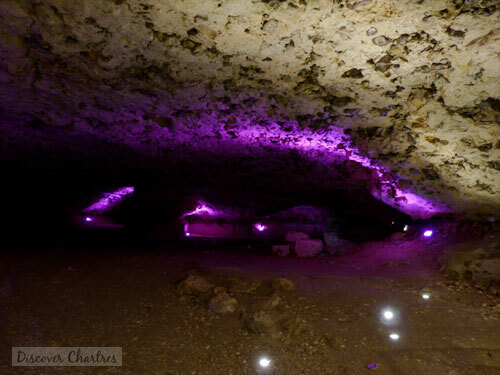 Bad news: photography inside the caves is not allowed. We didn't have time to visit the castle of Châteaudun that time but I couldn't resist to take a last picture of it from the moving bus.